Sue is a member of the firm’s Corporate Department focusing her practice on bankruptcy and creditors’ rights. 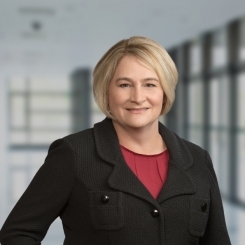 She advises and represents financial institutions in a broad range of litigation matters including the United States Bankruptcy Code and the Uniform Commercial Code (UCC). My family owns a photogrammetric engineering firm and has been involved in the business for over 40 years. It has weathered its share of setbacks over the years. During those times, I saw first-hand the impact a good legal advisor could have on the success of a business. Even in good times, the company’s attorney has played an integral role in its continued success. He was a friend as well as an advisor to my father, helping steer the company through the various minefields confronting a growing company. My father considered his attorney’s advice and counsel invaluable. Witnessing the partnership between my father and the company’s attorney inspired me to pursue a career in corporate law. What advice do you wish that you could give your younger self, just starting out in the legal field? I know many things now that I wish I had known when starting out in the legal field. The principal piece of advice that I would give my younger self would be not to hesitate to ask for help. Too often young associates are reluctant to ask for direction. They are afraid that they will appear weak or foolish. However, the opposite is true. Take advantage of the opportunities and resources available to you. You are surrounded by smart, talented and successful attorneys. Seek them out. Learn from them. Ask questions and listen, listen, listen. You will be a better lawyer for it. After all, great lawyers learn from other great lawyers. How has your previous experience helped you in your current role at Porter Wright? During my career, I have worked for large to small law firms as well as the Ohio Attorney General. While the dynamics of these experiences varied vastly, each has helped me immeasurably in my current role at Porter Wright. I have been fortunate to work with many talented and hardworking attorneys as well as dedicated paralegals and staff. Working with these individuals, I learned details and intricacies of the law as well as practice pointers which I use every day. I also learned essential negotiation, drafting and other technical skills that aren’t taught in law school. From dealing with clients to the importance of responsiveness and attention to detail, the lessons and skills that I gained from my previous positions are fundamental to my practice. Perhaps more importantly, I observed the importance of teamwork, preparation and civility – principles that I strive to emulate in my daily practice. Outside of work, I enjoy walking/hiking. Sometimes I walk alone; other times, I walk/hike with family and/or friends. Sometimes I walk in the morning; other times, I walk in the evening. No matter with whom I walk, when I walk, or where I walk, this is my time to relax. During morning walks, I prepare for the day ahead. When I walk in the morning, I am more focused and energized throughout the day. During evening walks, I decompress from the events of the day. Afterwards, I am less stressed and more present for my family. If you could have dinner with anyone, dead or alive, who would he/she be and why? There are many people that I would like to have dinner with if I could. The person in the legal profession that I would choose to have dinner with if I could would be Justice Ruth Bader Ginsburg. She is a pioneer for women in the legal field. Her experiences are instructive for all women no matter their profession. Her dedication and work toward gender equality are inspiring. Being able ask questions regarding her struggles as a woman in a male-dominated filed and hear her observations and advice first hand would be invaluable.